Nick Jones is an award-winning writer from Bristol, UK, but now living in Congleton. In 2014 he published Gagged and Bound, a book of original gags, puns and one-liners, which went on to become a best-seller on Amazon under Puns & Wordplay. This was followed by Gagged & Bound 2 and 3, and now Nick has returned with Sarah's Shadow, a highly original children's book about a little girl who loses her shadow. Illustrated beautifully by London-based artist Si Clark, Sarah's Shadow is a completely new direction for Nick, but with plenty more ideas up his sleeve it's one he intends to pursue further. Sarah's Shadow is a children’s picture book written by Nick Jones and illustrated by Si Clark. Yasmin Hughes seemed to take a perverse delight in tormenting and teasing Sarah, and the other kids always followed suit. When Yasmin pointed out that Sarah’s shadow was long and thin, just like Sarah was, all the kids started laughing at her. Sarah’s day had been totally ruined. She went home crying and wishing that she didn’t have a shadow. That night, as she was looking out her window, a shooting star flashed by overhead. Delighted, she ran downstairs to tell her mom and dad, who suggested that she make a wish on that star. Figuring out that wish was easy -- she wished her shadow would just go away. At first, nothing happened, but then she watched as her shadow slowly got up, waved to her and walked away. 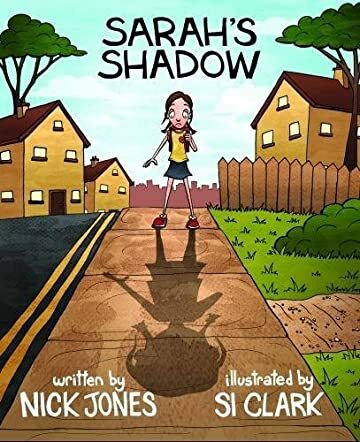 Nick Jones’ children’s picture book, Sarah’s Shadow, addresses the painful effects that actions of bullies can have on other kids -- both their victims and the kids who feel compelled to go along with them -- in a humorous story about a girl who wishes her shadow away. Sarah soon realizes that not having a shadow at all still makes her different and not like the other kids, still a target for mean kids like Yasmin. I loved the upbeat message of this tale and the power that Sarah finds when she rediscovers her shadow and becomes herself. Si Clark’s illustrations are fabulous, especially in the detail of the facial expressions of the characters in the story and Sarah’s amazing shadow creatures. Each panel is brightly colored, and the bold line drawings make it feel as though one is reading a comic book or a graphic novel. All kids want to belong and not to feel that they’re different from their peers, but as Sarah discovers, wishing away parts of yourself because a bully teases you is never the right answer. Sarah’s Shadow is most highly recommended.